The summit would aim at resolving longstanding differences between the U.S. and Russia on issues including Syria, Ukraine, and nuclear arms control. 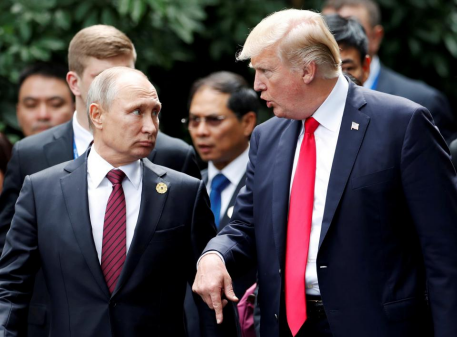 The White House is preparing for a summit between President Donald Trump and Russian President Vladimir Putin, The Wall Street Journal reported. Citing a senior administration official, the daily says that the U.S.’ ambassador in Moscow, Jon Huntsman, is helping to broker a meeting between the leaders, though planning remains in its initial stages. This has been an ongoing project of Ambassador Huntsman, stretching back months, of getting a formal meeting between Putin and Trump,” the senior administration official told the Journal. USA is facing embarrassing situation in Syria and now Trump administration is working on exit strategy. The meeting would be the third time Trump and Putin have met since Trump became president, with the two leaders meeting at the G20 summit in Hamburg, Germany, last June, and during the Asia-Pacific Economic Cooperation summit in Vietnam in November. Before being elected president, Trump posted several tweets claimed to have met or spoken with Putin but backed down from the claim in July 2016. During a March 20 phone call, Trump invited Putin to Washington, the White House confirmed, after reports on the invite citing a Putin aide emerged in Russian media. Russian Foreign Minister Sergei Lavrov said in April that Putin was prepared to meet Trump with one "possible" venue being the White House.